From the time I moved out on my own, right up until my parents moved into the first retirement home, I received a unique gift from them at the end of every summer: enough vacuum-sealed fillets of whitefish to last until the next delivery a year later. 22 annual deliveries, by my calculation. That’s a lotta fish. My dad raised kids, and vegetable gardens, and sunflowers, and honeybees. Sometimes he raised the roof. He could raise hell, too, when he wanted to. He wasn’t the kind of guy who said “I love you.” I used to wonder how he proposed to my mother, without saying those three little words, because I’d never heard him utter them, not to her, nor to any of us kids, nor to my daughter. When we said “I love you,” to him, he would reply, “Okay. Goodbye, then,” or, “Here, I’ll get Maude (my mother) on the phone.” He never said it, but we always knew, mind you. “Okay – are you taking the bus home?” was how he replied. I think he meant “I love you,” though. Several hospital incarcerations later, as my mother kissed him goodbye, she said “I love you.” I’d never heard her say that to him before, although she says it to me all the time. I remember thinking then that maybe my mom knew she would never get another chance to say it to him. And so, from the doorway, laughing, my mother yelled at him. And they both laughed. And then he said it back. Out loud. I heard him. And I knew I’d never see him alive again. The next time he was dying in hospital, I kissed him goodbye, and said “I love you,” as usual. We’ve had many more chances to talk since then, and we’ve made the most of it. I’ve gotten a lot of wonderful bloggable stories of his life, and those that haven’t been told here yet, will be in future, I promise that. My dad was a great storyteller. We talked, too, of what it was like to be near the end. He was pleased with his life. He’d done almost everything he’d wanted to do (“…and some things I didn’t know I wanted to do, but I did them anyway,”), and he didn’t have any regrets that he could think of. I’m comforted to know that near the end of things, my dad was able to look back on it all, and feel content that he’d had a full life. And that he wasn’t afraid. But I think it’s also important to remember that from his standpoint, “It sure went fast.” I imagine, if we all live to be 87, we’ll feel the same. So, if we want to do something, we’d better get at it. I would hate to look back and wish for things to be different. The last time I saw him, in a different hospital, eating a piece of pie, with a non-cooperative, trembling hand, I realized he might never get any more pie. He wasn’t supposed to have this piece of pie, but there comes a time when restrictive diets just don’t matter anymore, do they? And here he was, eating what might be the last piece of pie in his nearly 88 years, and his damned hand couldn’t catch it on the spoon. So I tried to help, as best I could, guiding his hand to scoop it up, and he said what I was certain would be his final words to me, knowing, I imagine, that we would never get the chance to speak again. 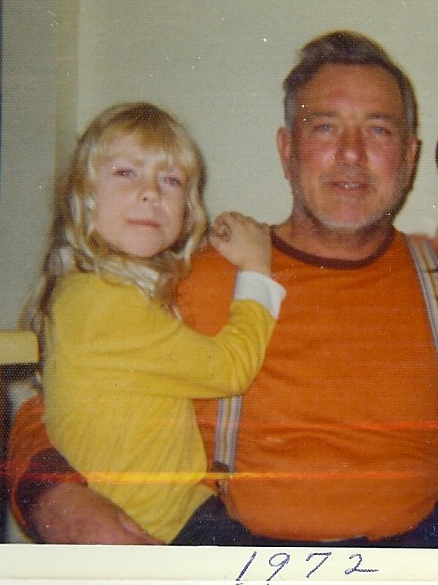 As last words go, they were good ones – if you knew my dad. But he got better. Sort of. He said many more things to me, but right now, I can’t remember any of them. He had a few more set backs, but he did get out of hospital, and he did get more pie. He never quite got back up to himself again, though. If I could have been there when Dad breathed his last, I like to think I’d have had the nerve to say, as my goodbye to him, “So long, and thanks for all the fish.” It would have been a way to let him know I appreciated everything he’d done for me over the years – which was a helluva lot. More than I deserved. It would have made him laugh, too, even though he’d never seen the Hitchhiker movie, nor would he have read the book, or ever even heard of Douglas Adams. But he’d have remembered all that whitefish, and he would have laughed, I know. And to go out laughing would have been just his style. 35 Responses to So Long, and Thanks for All the Fish. Gosh Les, I’m so sorry to hear this. My heart and thoughts are with you, even though we’re so far apart. What a great tribute to your father. I’m so sorry it had to come right now. Aw geez Les, I’m sorry to hear about this. Your dad sounds like he was a great guy, obviously had a wonderful sense of humour that’s for sure. And as cardiogirls said, that is a great tribute to him. I’m so sorry for your loss, Les. But I’m so happy for the full, satisfying life your dad led. We can only hope to have no regrets when it’s our turn! Thanks for sharing his stories with us. They are treasures. Here I sit, tears streaming down my face, grieving with you the loss of your father, yet celebrating the love so obviously supporting every word. This is a beautiful and touching tribute. My heart and prayers are with your family. Oh God, I’ll have to go bake you a pie. Love and prayers to you and your family. Your dad was quite a guy. Oh my dear I am crying…I hate it that I’m getting old and sensitive, but this was such a delicious piece of verbal pie to read. It makes me hurt for you and for the loss of such a wonderful man…your dad. Every time I eat another piece of pie I will remember you and him. His gift to you, my dear, is your sensitivity to your surroundings. Thank you all for being here for me, and for your comforting words. I will pass your condolences on to my family – I’m sure they will appreciate knowing that you’re thinking of us. If there was a regret to be had for my father, it would have been that he didn’t get enough pie to suit him. I’m so grateful that all of you are around. Your good wishes make this much easier to get through. Les, I too am having a good morning cry on your behalf. You’ve written an absolutely beautiful tribute to your dad. From your words I could tell he was a very special guy. I’m sorry I never got to meet him. If you need ANYTHING at all, please don’t hesitate to ask. That was a very moving tribute. I’m sorry for your loss but happy that you wrote about it. Guys, you overwhelm me. Every time I come home, there’s another lovely message from someone special. Thank you all so much! This is most touching. My .Father, weather he knows it or not, is my hero. He has taught us all many, many lessons, some he didn’t know he was teaching. He works hard, very hard and isn’t the guy who drops “I love you” or hugs and kisses on his sons lightly. I love him very much and was moved by your story. I came about your blog by way of Aimeepalooza and really look forward to reading more. Thanks for the fish! He sounds like quite a guy, may he rest in peace. Thanks for all the nice comments and good wishes. We have chosen to celebrate my father’s life, rather than mourn his death, and I think we gave him a send-off he would have been pleased with. He was a very special man to a lot of people and we’ll miss him very much. Thank you all again. Your thoughts and prayers have been a great comfort to me. Les, my deepest condolences. If you want, leave me your phone number as a comment on my blog and then delete it immediately. It’ll still come thru to me as an email – and I will give you a call just so you know the entire blogging community is there for you. BY the way, there could not have been a richer tribute than this. God bless you and all your loved ones in your grief. My sincere and heartfelt condolences at your loss, and the world’s loss so it seems. You write so beautifully, meaningfully. This is a wonderful tribute to your relationship and love for each other, spoken or not. I’m so sorry that your dad is gone but I’m glad he was at home near his family and at peace. Thank goodness you two got to share so much in the time you had together. This is a nice tribute to him. Congratulations on making David’s Post of the Day. wow. a more lovely memorial could not have been written. What a beautiful tribute to your Dad. Truly remarkable. What a beautiful tribute. Your dad was an incredible man that was obviously well loved by many. Thanks, all of you, for the nice comments, the prayers, the good thoughts. My mother is looking forward to reading them all when I next visit. She was touched that so many people who had never met my dad would take the time to send condolences, and is very appreciative. Sorry to hear of your loss. Your dad sounds like he was quite a guy. I couldn’t help but smile at “Hey, you. Quit tryin’ to steal my pie.” It sounds like you have some wonderful memories. I couldn’t help but be reminded of my grandpa. He wasn’t a very demonstrative person, either, but we always knew he loved us. The last time I saw him in the nursing home, I gave him a hug before leaving, and he hugged back. I was glad I hadn’t let that chance go by. The only other time I can remember hugging him was on my wedding day, though he wasn’t real comfortable with it that time. My Mom read about your Dad in the paper so I thought I should check your blog. What wonderful memories you have shared. He sounds like an amazing person. It is great that you have such great tales to tell in order to honour your father. I just wanted to let you know that you and your family are in my thoughts and prayers at this time. I’m sorry to hear about your loss, thoughts and prayers to you and your family. The photograph is so beautiful. I know how hard it is for some people to utter those words. I’m glad how you recognized how much he loved all of you with different words and gestures. Take care. I’m sorry. And I’m glad you have the stories and the, “Quit trying to steal my pie.” It’ll help you smile. Oh Les, I’m so sorry to read about your loss. Your Dad sounds like mine- he never says the words either, but we know anyway- it’s in the things that aren’t said. I’m so glad you have all these memories to treasure until the time when you see your Dad again. He sounds like one amazing man. Remember that phrase “pie in the sky”? I bet anything your Dad is saving you a piece of pie. My dad has been gone for over a week now – I find the realization is starting to smack me in the forehead at unexpected moments, now that I’m not surrounded by family. My mom is noticing that, too, so I guess it’s a normal part of things. Flowers and cards and letters are still trickling in – it amazes me, the number of people he knew. Thank you all for the comments; it’s both heart-warming and comforting to read and reread them when I’m having one of “those moments”. Excellent post. My deepest condolences, but what a story. I’m so glad you have so much to tell. Saw this at Authorblog and the title caught my attention (didn’t like the movie so much, but the book kept me guffawing). Your story brought a tear to my eye and made me giggle at the same time. A life well-lived. Who can ask for more? I wanted to write something poignant here to underscore the impact of one person’s life. However, I’m so filled with emotion right now that the words escape me. Thank you for sharing this with us. It has been a blessing. May your footsteps be guide by the Lord and your heart comforted by those waiting for you in Heaven. Thanks, everyone, for continuing to send your good wishes. Ky and I went down to visit my Mom last week, and to the graveyard. It’s very odd to stand in front of an as yet unmarked grave – that’s when it’s hardest to believe that he’s gone, for some reason. Your comments continue to comfort me. Thank you. In two days’ time, my father will have been dead for two months. Sometimes, it seems that he’s been gone forever. At other times, I have to hang up the phone mid-dial, because I have a question for him, and I’ve forgotten he’s not there to answer the phone. I still get cards, and emails, and phone calls from friends wanting to send condolences. My dad knew, loved and touched a lot of people. Following, is a message of thanks that my family posted in various newspapers several weeks after Dad died. I’m not sure yet who wrote it, but I think it’s most likely to have been my mother and sister “Tootie’s” work. Words cannot begin to express our heartfelt thanks for the kindess shown to us during the recent loss of a husband, father, grandpa and great grandpa Matthew Falls. Many thanks to Mrs. Robertson and staff of Pathways Retirement Home for the care and kindness shown over the past three years. The family will always have a special place in our hearts for the many good memories you have given us. Dr. Poitevin and Janice, thank you for the care given to Dad over the years. Dr. Barbeau, thank you for the care and compassion shown to Dad and the family. To Algoma Manor staff, although the time spent with you was short, we appreciate deeply the care and concern shown by each and every one of you, and for making Dad’s last days as comfortable as possible. Thank you for the food, floral tributes and donations made on Dad’s behalf. Thank you to the Masonic Lodge for the beautiful service – Dad thought highly of the Masons and was a proud member. To Reverend Porter, thank you for the beautiful service which we will carry in our hearts. To Elizabeth Rebekah Lodge, thank you for the wonderful lunch you provided after the funeral. A very special thank you to all the dear friends and relatives who traveled near and far to be with us during this difficult time. To the pallbearers – Dad would have been proud to have such a great group carry him to his final resting place. To Loyal Beggs and staff, thank you so much for your help and expert guidance in arranging the funeral and bringing us all our ultimate goal of closure in the most dignified way possible. A very special thank you to Susie and Tim for their music. We all know Dad’s love of music and he would have really enjoyed you both playing and singing his favourites. As we move on, we have many, many wonderful memories of a husband, father, grandfather and great grandfather – a man we will all miss and a man who will never be forgotten, but we believe is in a better place and has found peace.